The spiro- indole-pyrrolidine ring system is a frequently encountered structural motif in many biologically important and pharmacologically relevant alkaloids. The derivatives of spirooxindole ring systems are used as antimicrobial, antitumour agents and as inhibitors of the human NKI receptor besides being found in a number of alkaloids like horsifiline, spirotryprostatin and (+) elacomine. The recently discovered small-molecule MDM2 inhibitor MI-219 and its analogues are in advanced preclinical development as cancer therapeutics. 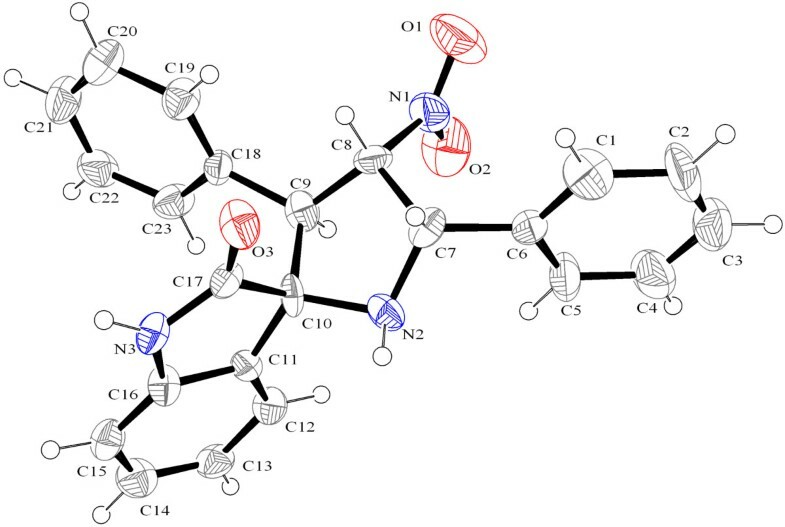 In the crystal structures of the two organic compounds, 4'-Nitro-3',5'-diphenylspiro[indoline-3,2'-pyrrolidin]-2-one and 3'-(4-Methoxyphenyl)- 4'-nitro -5'-phenylspiro[indoline-3,2'-pyrrolidin]-2-one, N-H···O hydrogen bonds make the R2 2 (8) ring motif. Further, the structures are stabilized by intermolecular hydrogen bonds. The crystal structures of 4'-Nitro-3',5'-diphenylspiro[indoline-3,2'-pyrrolidin]-2-one and 3'-(4-Methoxyphenyl)- 4'-nitro -5'-phenylspiro[indoline-3,2'-pyrrolidin]-2-one have been investigated in detail. In both the compounds, the R2 2(8) motif is present. Due to the substitution of methoxyphenyl instead of phenyl ring, the entire configuration is inverted with respect to the 2-oxyindole ring. 1,3-Dipolar cycloaddition of azomethineylides to exocyclic olefins constitutes a versatile protocol for the construction of poly functionalized spiro-heterocycles viz. pyrrolidines  and pyrrolizines , which widely occur in natural products and biologically active compounds. The spiro- indole-pyrrolidine ring system is a frequently encountered structural motif in many biologically important and pharmacologically relevant alkaloids. 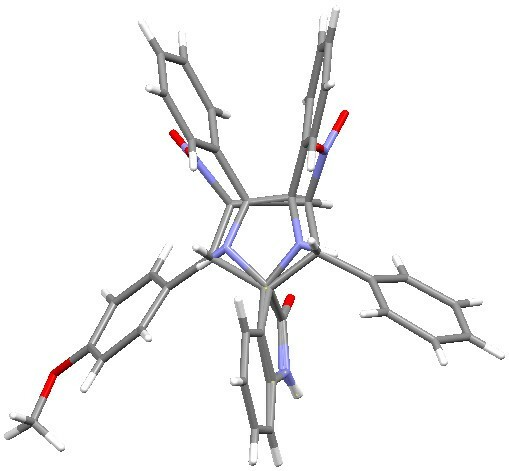 Compounds with an indole/oxindole framework are promising pharmacophore which exhibit interesting applications in the biological and pharmacological arena . The derivatives of spirooxindole ring systems are used as antimicrobial, antitumour agents and as inhibitors of the human NKI receptor besides being found in a number of alkaloids like horsifiline, spirotryprostatin and (+) elacomine . The recently discovered small-molecule MDM2 inhibitor MI-219 and its analogues are in advanced preclinical development as cancer therapeutics . Our interest in preparing pharmacologically active pyrrolidines led us to the compounds, 4'-Nitro-3',5'-diphenylspiro[indoline-3,2'-pyrrolidin]-2-one (I) and 3'-(4-Methoxyphenyl)- 4'-nitro -5'-phenylspiro[indoline-3, 2'-pyrrolidin]-2-one (II), and we have undertaken the X-ray crystal structure determination of these compounds in order to establish their conformations. The spiro compounds reported in the present work were prepared (Scheme 1) by following our earlier literatures method [6–8]. A mixture of (E)-(2-nitrovinyl) benzene or (E)-1-methoxy-4-(2-nitrovinyl) benzene (1 mmol), isatin (1 mmol) and phenylglycine (1 mmol) was heated to reflux in methanol on a water-bath for 40 min. The progress of the reaction was monitored by thin layer chromatography (TLC). The starting materials vanished in the TLC indicating the completion of the reaction i.e, the azomethineylide (dipole) reacts with the substituted vinyl benzene (dipolarophile). Then, the reaction mixture was poured into crushed ice, the resulting solid filtered and washed with water to afford pure regio and stereoselective 3'-Phenyl-4'-nitro-5'-phenylspiro[indoline-3,2'-pyrrolidin]-2-one or 3'-(4-Methoxyphenyl)-4'-nitro-5'-phenylspiro[indoline-3,2'-pyrrolidin]-2-one in good yields. The synthesis scheme of 3'-(aryl)-4'-nitro-5'-phenylspiro[indoline-3,2'-pyrrolidin]-2-one is shown below. For compound (I): Yield 80%; M.p. 239°C. For compound (II): Yield 78%; M.p. 231°C. Synthesis scheme of the compounds. In both the molecules, the 2-oxyindole ring is planar (r.m.s deviation: 0.031 Å and 0.018 Å for I and II, respectively), which is common in spiro complexes [9, 10]. The spiro rings of both molecules have the twisted envelope structure with the N atom at the flap position. The distance to the flap position from the mean plane of spiro carbon atoms, are 0.531(3) Å and 0.503(2) Å in compounds (I) and (II), respectively. The phenyl ring and methoxyphenyl rings are inclined by an angle of 31.45 (2)° in compound (II) which is similar to the inclination of the two phenyl rings in compound (I) (31.60(2)°). 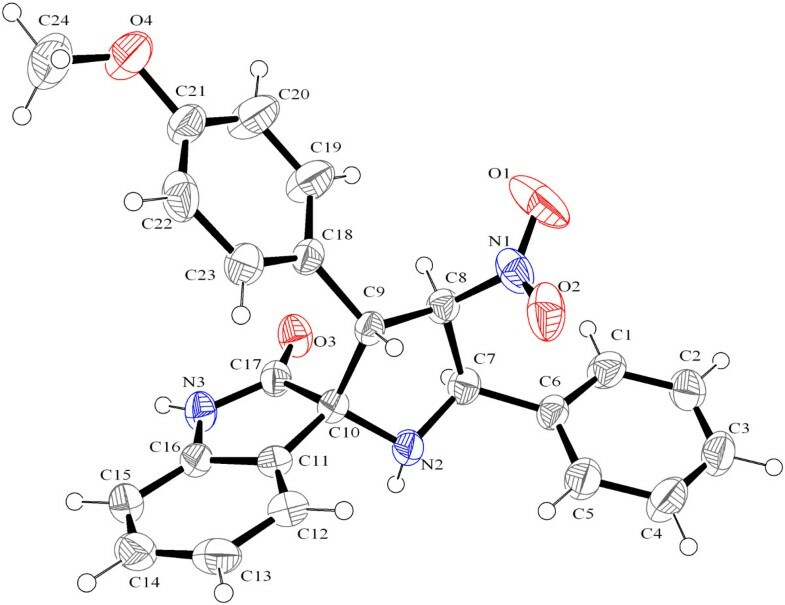 In compound (II), H9 and H8 have trans conformation with the torsion angle of 152.45(2)° (H9/C9/C8/H8) and H8 and H7 have cis conformation with the torsion angle of -5.43(2)° (H8/C8/C7/H7). In compound (I) also, similar conformation is found. The hydrogen conformation torsion angles in compound (I) are 152.81(3)° and 7.14(3)° for H9 & H8 and H8 & H7, respectively. Even though these conformations are similar, the directions in which the hydrogens are attached, are reciprocal in both the compounds. Figure 1, a superimposition of the planar 2-oxyindole rings, drawn using Mercury , clearly shows the reciprocal conformations of both the compounds. In both molecules, N-H···O hydrogen bonds make the R2 2 (8) ring motifs (Figure 2 and Figure 3). Further, the structures are stabilized by intermolecular hydrogen bonds. Reciprocal conformations of both compounds, as seen from the superimposition of the planar 2-oxyindole rings. Figure showing the intramolecular hydrogen bonds resulting in R 2 2 (8) motif in compound (I). Figure showing the intramolecular hydrogen bonds resulting in R 2 2 (8) motif in compound (II). Single crystal X-ray intensity data for the compounds (Scheme 2) and (Scheme 3) were collected using a Nonius CAD-4 MACH 3 diffractometer with MoKα (0.71073 Å) radiation at room temperature (293 K). The data reduction was carried out using XCAD4 . The absorption corrections were applied using the ψ-scan method . The structures of both the compounds were solved by direct methods using SHELXS97  and all the non-hydrogen atoms were refined anisotropically by full-matrix least-squares on F2 taking all the unique reflections using SHELXL97 . 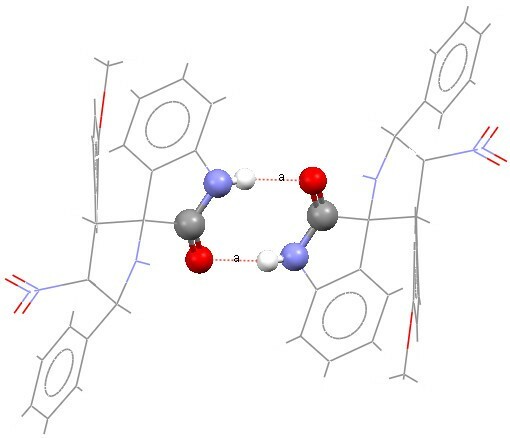 The hydrogen atoms attached with carbon atoms were placed in their calculated positions and included in the isotropic refinement using the riding model with C-H = 0.93Å (-CH) or 0.97Å (-CH2) Å or 0.96Å (-CH3) Å with Uiso(H) = 1.2 Ueq (parent C atom) and amino bound hydrogen atoms were located from the difference Fourier map and include in the refinement isotropically. The crystal data, experimental conditions and structure refinement parameters for the compounds (I) and (II) are presented in Table 1. The re-crystallization of the compound (I) and repeated data collection with different crystal samples did not improve the R value and other statistical parameters. Crystals of better quality could not be obtained for the compound (I). Table 2 gives the geometry of the hydrogen bonds present in I and II. The molecular structures of compounds (I) and (II) showing the atom numbering scheme using ORTEP-3  are given in Figures 4 and 5, respectively. Scheme showing the structural formula of compound (I). Scheme showing the structural formula of compound (II). The molecular structure of compound (I) showing the atom numbering scheme. Displacement ellipsoids are drawn at the 40% probability level, using ORTEP-3. Hydrogen atoms are drawn as spheres of arbitrary size. The molecular structure of compound (II) showing the atom numbering scheme. Displacement ellipsoids are drawn at the 40% probability level, using ORTEP-3. Hydrogen atoms are drawn as spheres of arbitrary size. The title compounds were synthesized and the corresponding molecular crystal structures have been determined by single-crystal X-ray diffraction. In both the compounds, the R2 2(8) motif is present. Even though most of the conformational features are similar when seen separately, by super positioning the two structures it is found that the entire configuration is inverted with respect to the 2-oxyindole ring. This is due to the substitution of methoxyphenyl instead of phenyl ring in compound (I). Crystallographic data (excluding structure factors) for the structures of compounds (I) and (II) reported in this paper have been deposited with the Cambridge Crystallographic Data Centre as supplementary publication numbers, CCDC 802309 and CCDC 802308, respectively. Copies of the data can be obtained free of charge, on application to CCDC, 12 Union Road, Cambridge CB2 1 EZ, UK. (fax: +44-(0)1223-336033 or email: deposit@ccdc.cam.ac.uk). One of the authors (JK) thanks the UGC for the RFSMS fellowship. SN thanks the CSIR for the funding provided under the Emeritus Scientist Scheme. JKS collected the X-ray data and solved the crystal structures under the guidance of SN. SMR and JS synthesized the title compounds under the guidance of SP. All the authors read and approved the final manuscript.